Bayit Yehudi party head Naftali Bennett finalized the appointments party members will receive in the government. Members of the Bayit Yehudi Knesset faction met Sunday, for their first full meeting as members of Binyamin Netanyahu's government. 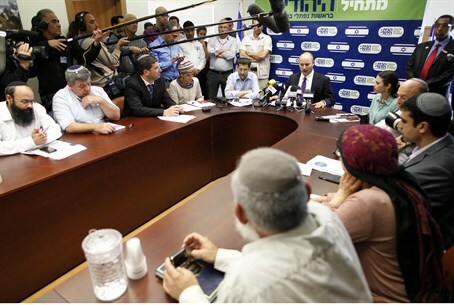 During the meeting, party head Naftali Bennett finalized the appointments party members will receive in the government. One of the party's most important accomplishments was the attainment of leadership of the Knesset Finance Committee, which is one of the Knesset's two most important committees, along with the Foreign Affairs and Defense Committee. Bennett has appointed MK Nissan Slomiansky to head the Finance Committee, taking over for MK Moshe Gafni of United Torah Jewry. UTJ is not a member of the new government. Bennett himself will be Economics and Trade Minister, in a revamped version of the Industry, Trade and Labor Ministry. Bennett will also be responsible for the Religious Affairs Ministry, with the deputy minister, Rabbi Eli Ben-Dahan of Bayit Yehudi, expected to handle the Ministry's day to day affairs. MK Uri Ariel, number two on the Bayit Yehudi list, will be Housing Minister, and have Ministry responsibility for the Israel Lands Administration, in a function that had previously been part of the Prime Minister's Office. Ariel will also be responsible for the budgets of social and religious “gar'inim” (small educational communities). MK Uri Orbach will be Minister for Elderly Affairs. Bayit Yehudi's central committee approved the appointments and coalition agreement in a meeting at Bar Ilan University Sunday evening.